For some time now, I’ve been thinking that I really have to build a dedicated blacksmith’s shop. Dragging my stuff out of the garage to work in the driveway is less than ideal, to say the least. It takes a lot of time to set-up and tear down, and is seasonal and weather dependent. I’d briefly considered converting a part of the garage, but still need a general workshop – and really don’t want to mix smithing and woodworking in the same space; so dismissed that idea pretty quickly. Behind the garage is a virtually abandoned bit of the property, where my late in-laws had stored ‘stuff’ out of sight behind a fence (a utility trailer, a couple of old BBQs, composters, stacks of firewood, etc.). The whole area was in pretty rough shape, overgrown with weeds and such. But when I stood back and looked at it, I realized it’s actually a fair bit of space. So, I have pretty much decided to build a small (10′ x 12′) shed in this area to use as a shop. The size is based on a) what will fit comfortably in the available space, and b) 120 sq.ft. is the maximum size I can build without the added headaches of a building permit. I’ve been trying to decide on a type / style of building for this, and think I’ve found it. I recently bought an excellent book entitled “Sheds – The Do-It-Yourself Guide for Backyard Builders” by David Stiles. 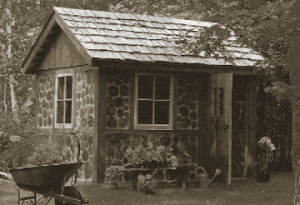 The shed shown on the cover of that book uses ‘cordwood masonry’ for the walls, which I like the look of a lot. The other source is a blog that I only just found, called “Peeling Logs“. There is a post on that blog by contributor Jon Anderson about the building of a 10′ x 12′ post and beam / timber frame shed, which is exactly what I had in mind. And they have even gone so far as providing the Google SketchUp plans for it too – Awesome!!! Just as soon as I can find the time, I think I’d like to build a shop based on those timber frame plans, but with a look somewhat along the lines of the ‘Irish Shed’ from David Stiles book. This entry was posted on Friday, June 1st, 2012 at 1:02 pm	and is filed under Resources. You can follow any responses to this entry through the RSS 2.0 feed. You can leave a response, or trackback from your own site.